At Palmer Dental Group , we are dedicated to helping you and your family achieve healthy, beautiful smiles. At our Haysville family dental practice, Dr. Scott Palmer, and Dr. Toby Lee offer a number of preventive, restorative, and cosmetic procedures tailored to help patients of every age improve their long-term oral wellness. At our Haysville dental practice, we believe all patients deserve access to dental care that appropriately meets their unique oral health needs while enhancing the look of their smile. Whether you’re bringing your child in for a routine check-up or are a senior patient seeking tooth restoration with dental implants, our dentists are committed to providing each patient with the care they need when they need it. We believe that consistent, comprehensive care is the key to a healthier, lasting smile. When you visit Palmer Dental Group, you see the same friendly dental team that is familiar with your unique smile and needs. By integrating the latest technologies into routine as well as complex treatment plans, our dental team is able to develop care strategies that improve your entire smile, not just certain parts of it. When combined, our dedication to consistent care at the hand of experienced dental professionals allows our Haysville dentists to provide each patients with the care they need in an environment they feel comfortable. Since we first opened our doors in 1994, Palmer Dental Group has been committed to enhancing patients’ smiles and long term oral health. 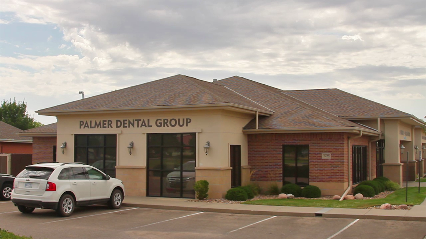 Located on 71st St. & Meridian east of Casey’s, Palmer Dental Group welcomes patients of all ages from the Haysville, Wichita, and Derby communities. To learn more about our available dental services, our dedication to our patients, or to schedule your next dental visit , make sure to contact Dr. Palmer and his team today!